University Health Services at the University of the District of Columbia introduces the university’s health and wellness initiative Get Up and Move! 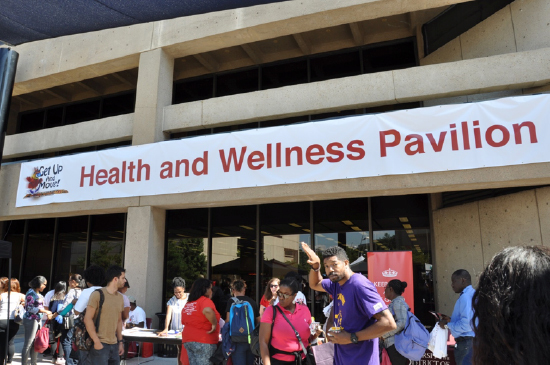 This comprehensive health and wellness initiative is an interdisciplinary collaborative partnership between University Health Services, UDC Athletics, UDC Counseling Centers, Center for Nutrition Diet and Health, UDC’s Wellness Center, the Campaign 9:30 grant program, faculty, staff and students from the university’s academic programs. The initiative offers a combination of physical activity, disease prevention workshops, health promotion programs and learning about healthy lifestyles in a fun, interactive way. Students have the opportunity to learn about nutrition and engage in activities that improve their physical fitness, mental health and overall well-being. Each program is designed to encourage healthier living for the university community. The health and wellness initiative aligns with many goals of the university’s strategic plan vision 20/20. The Get Up and Move! Health and Wellness Calendar lists the activities and events occurring throughout the academic year including weekly physical fitness sessions such as aerobics, swimming, strength training, national health awareness activities, and more. Get Up and Move! launched its health and wellness programs in 2014 with an appearance and lecture by healthy living advocate, Dr. Ian K. Smith, MD. The best-selling author and medical expert who is a recurring co-host on the Emmy® Award-winning talk show, The Doctors, and the creator and founder of two far-reaching national health initiatives — The 50 Million Pound Challenge and The Makeover Mile. Dr. Ian talked with students and conducted a fitness demonstration on the Dennard Plaza during the 9th Annual Back-to-School Barbeque on Thursday, September 11, 2014. Combining these comprehensive programs, Get Up and Move! is about linking students and the university community to the paths of a healthy future during their time at UDC and beyond. Our 2016-2017 theme for health and wellness is Healthier Ever After. “There’s overwhelming research evidence that students who lead healthy active lifestyles do better academically and are less likely to experience major illnesses which may impede their academic success.” – Dr. Ayana Elliott, Director of University Health Services and Chairperson, Get Up and Move! initiative. To provide individuals with opportunities to begin activities at various levels of experience and physical capabilities that cultivate the progressive incorporation of intentional physical fitness into their lives. To empower individuals to make healthier food choices through counseling, workshops, and educational tools developed from nationally recognized authorities on nutrition. To improve access to knowledge on physical and mental health seeking behaviors, disease prevention, and enhancing overall well-being at the individual, community, and population levels. To increase awareness of the smoke-free campus policy, the dangers of tobacco use/abuse, maintain an active action plan that builds on the Smoke Free U. program developed in 2015-2016 to decrease tobacco use and fortify a smoke-free campus. We work out in shallow water; you do not need to know how to swim. Aqua Fitness is low-impact exercise that is healthy for your joints and will help improve back pain. You do not have to get your hair wet, but we do splash!! There are lifeguards on the pool deck. 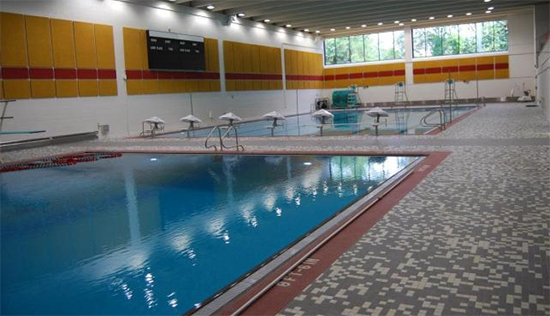 Classes are taught by a certified aqua fitness instructor Kim Crews. I will work with you if you have a fear of the water. Some of my students have gone on to take swimming lessons. Aqua fitness is fun and reduces stress.